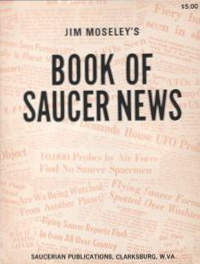 Over his career, Jim Moseley accomplished a number of significant contributions to the UFO field. Some, more serious than others! 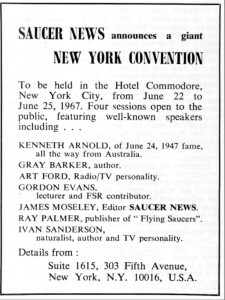 This section will feature some of the most magnificent ones, starting with the 1967 New York City Saucer News UFO convention . 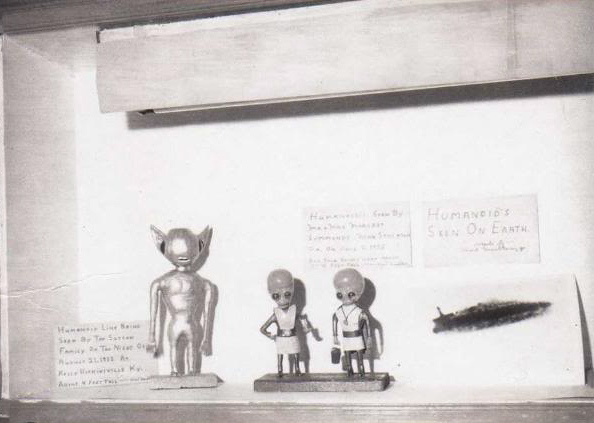 These days UFO conventions and symposiums are being held by various groups and promoters just about all year long and in all parts of the world, and have provided many UFO writers and personalities a steady source of extra income. But back in the day that wasn’t the case at all. 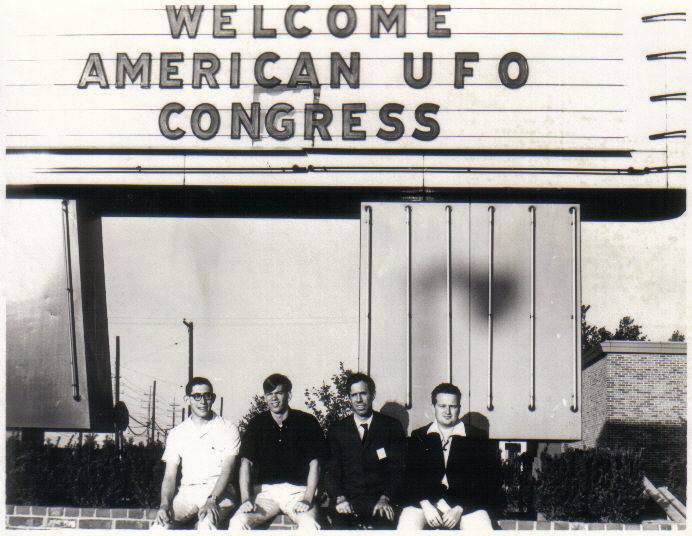 Sure, the contactee element of the UFO field had it’s share of conventions and meetings at various venues starting as best as I can uncover, way back in 1953 in the Los Angeles area. 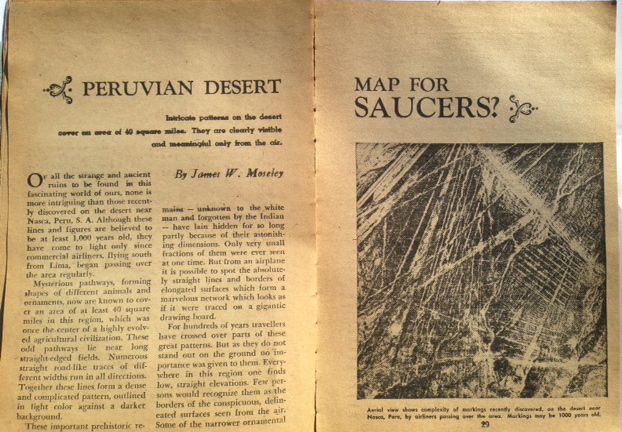 This was a year or two before George Van Tassle’s Giant Rock gatherings out in the California desert that would run until 1970. 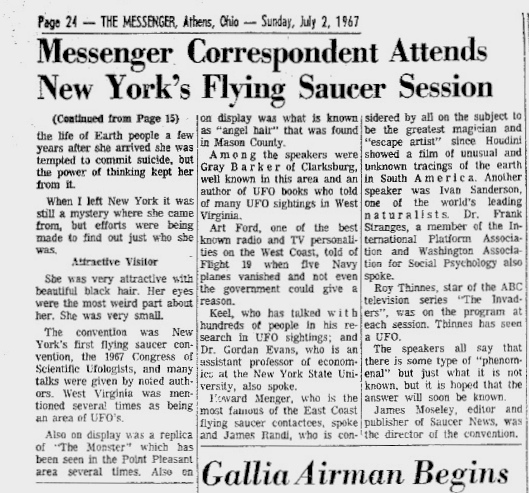 However, the “serious” side of the UFO movement wouldn’t see its first large scale gathering until the first Congress of Scientific Ufologists – its name was later changed to the more mainstream sounding National UFO Conference – was held in Cleveland, Ohio in June of 1964. I was one of the many organizers of the affair and it enabled serious students of the UFO phenomenon a chance to get together and exchange information and generally cooperate with each other in the hopes that some answer to the mysterious platters could one day be found – not too much different from what organizations such as MUFON are doing now. Besides, it was a great excuse to hold public meetings featuring many of the delegates, and thereby “spread the word”, so to speak. 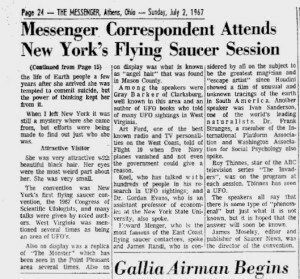 Jim Moseley liked the idea right from the get-go and attended the first Congress in ’64 and gave it lots of publicity in his Saucer News. 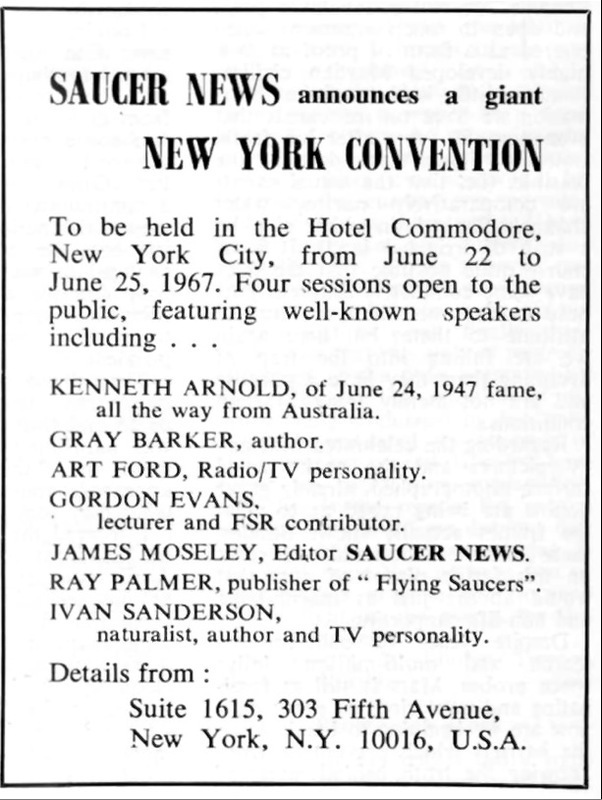 After two more successful gatherings in Cleveland, Jim got the idea to hold a really big convention in New York City in 1967 and got busy booking many well known UFO writers and researchers representing all aspects of the UFO belief spectrum. 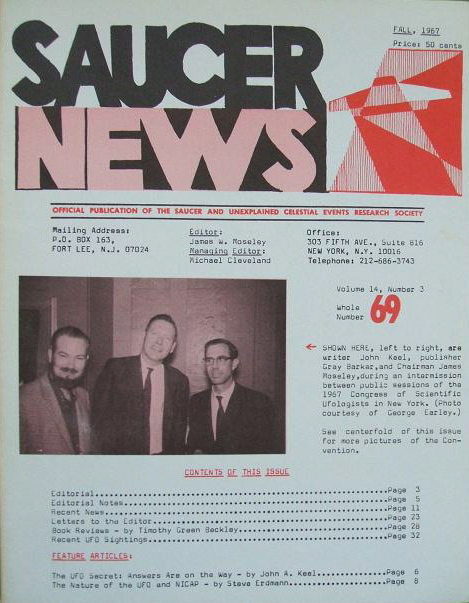 Many of the other UFO publications also publicized the event and interest for such a big gathering of the faithful was running high as the new year of 1967 was dawning. 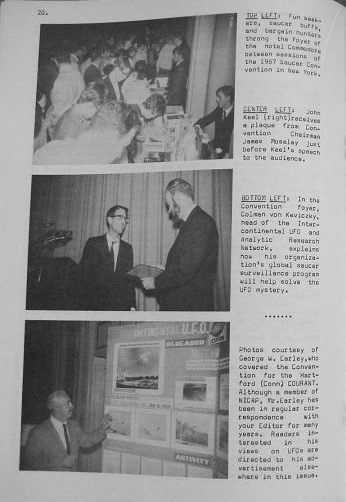 And let’s not forget that 1967 was the 20th anniversary of the Kenneth Arnold sighting. 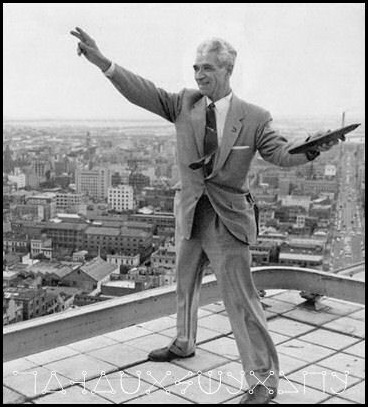 Jim secured the Grand Ballroom as well as the East Ballroom of the huge Hotel Commodore at Lexington Avenue and 42nd Street right in the heart of Manhattan from Thursday June 22 through Sunday the 25th for the open public programs as well as the delegate only “closed sessions.”Some of the many speakers included prominent names such as: Joe Franklin of WOR -TV, Gordon Evans, Art Ford, Frank Stranges, John Keel, Stewart Robb, Gray Barker, James Randi, Long John Nebel, Howard Menger, Ivan Sanderson, and I guess you get the picture by now. Jim even booked Roy Thinnes, the star of the hit ABC-TV science fiction thriller The Invaders (” David Vincent knows!” ) for appearances at the Saturday afternoon and evening public sessions. All in all lineup that hasn’t been duplicated before or since. And looking back, can you believe that admission to each of the four public meetings was a measly two bucks! And on top of all this, who shows up unannounced in the audience Saturday afternoon but Edward Condon of the infamous Condon Committee. Yes sir and Bob, a real three ring circus. As for me, I almost didn’t make the party. Several months before, I entered the management training program at my place of employment, and was scheduled to work that weekend and couldn’t find anyone to cover for me. To say I was disappointed is a gross understatement – hell, I was totally bummed out! However, on Thursday afternoon a kind soul took pity on me and offered to cover my job, so I was now able to attend after all! I rushed home after work and called the Commodore to secure a room ( Yeah, an unremodeled emergency spare room with peeling paint located next to the elevator shaft – just like you see on the TV sitcoms. ) and booked a flight into New York on the Friendly Skies for the next morning. I arrived at the hotel just before lunch that Friday and headed down to the Ballroom foyer where the tables for book sales and whatnot were being put up for the first public session that evening. 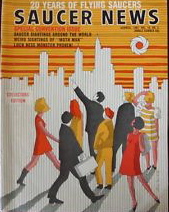 There I ran into old friends Robert Easley, Allen Greenfield, Tim Beckley, Gene Steinberg as well as a very uptight Jim Moseley. After a lunch a nearby deli it was time for the “closed session” where the delegates could bring up all sorts of new business and ideas for this and that that the organization as a whole might cooperate on. Alas, most of the business concerned Jim’s long standing feud with the NICAP organization and resulted in generally a bunch of unproductive resolutions. It was still good to get together and talk with old and new friends, so the time wasn’t really wasted. 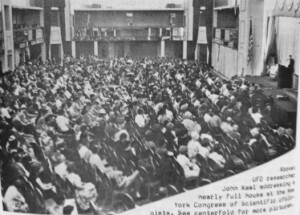 The rest of the convention is a blur to me after all these years, but I do remember that just about all of the speakers were interesting and I never left my seat during any of the programs. 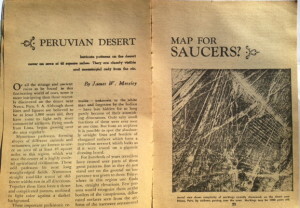 Maybe that was the case or maybe I was just a young flying saucer fiend getting his fix. I do know that the best part of this ( or any convention ) convention were the late night “shop talk” bull sessions that kept me from getting but a few hours of sleep each night of that magical weekend. By the time I got back to my room I was too darned tired to be bothered by the constant elevator earthquakes, anyway. Two things stand out after all these years. The first is helping Robert Easley sell Jim’s many books and magazines in the Ballroom foyer on Saturday afternoon, and being grabbed by Jim and handed a cash box and being told to take money for admissions at one of the unmanned doors to the Ballroom. Seems as if quite a few people who were supposed to sell tickets didn’t show up, and people were just walking right in at several points without paying their two bucks. The second is being asked to be Roy Thinnes’ bodyguard on Sunday morning along with Robert Easley and Jack Robinson and get him out of the hotel without being mobbed by his fans. Even though the staff took us down service corridors and freight elevators to the back way out several fans saw Thinnes and chased us all the way to a waiting cab. Poor Jack even got punched by one of the angry fans in the process. 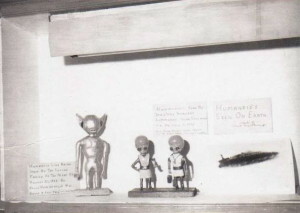 So there you have it, my recollections of that Giant UFO Show so many years ago. How many attended it? 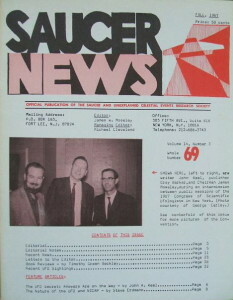 I estimated at the time that about a total of six thousand saucer buffs plunked down ( or not ) their cash to attend. Can you imagine the “take” in today’s admissions for a crowd that size? We’re talking some serious money indeed! 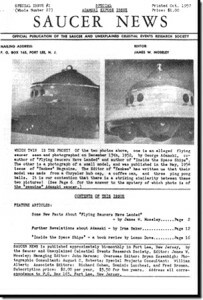 Saucer News exposes the George Adamski flying saucer fraud! Jack Robinson was my uncle. 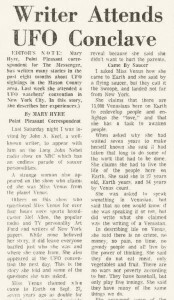 I remember when my mom and I visited Jersey City in August 1967 we stayed with Jack And Mary and she told us about being watched by MIBs. I was happy to hear from you. I knew Jack and Mary fairly well in those days, and visited him a number of times. I’d love to hear about Jack and Mary too. In the old days, they were among my favorite people. I describe Jim and a party in his Ft. Lee, NJ apt in my book, Voluntary Peasants. 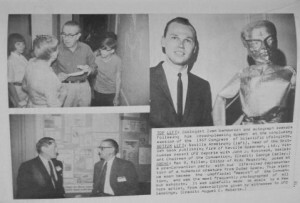 I was Jim’s friend, associate editor and PR man in the 60s, arranging and accompanying Jim to radio shows in NYC & Philly. Jim gave me my very first journalism assignment to interview Andy Sinatra, the “Mystic Barber” about his aluminum foil headgear to ward off something or other. Jack Robinson first introduced me to the mystic chant OM and to the “Hung Sau” breath technique of Yogananda. 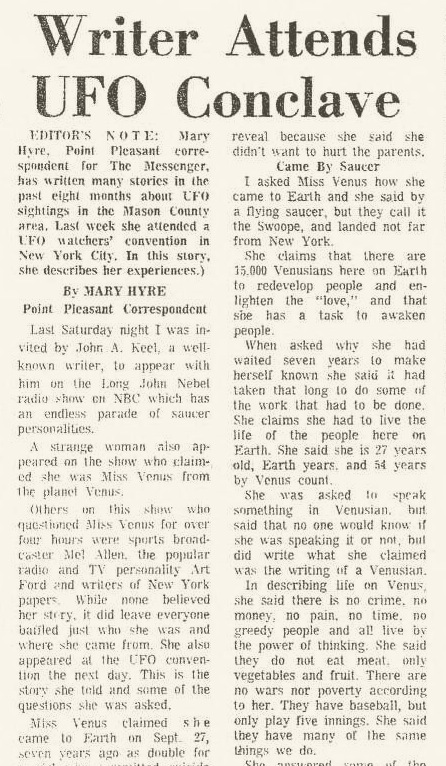 My sister, Rona Stiriss, was Miss UFO at the NYC conference. Jim was my phone buddy for 50 years. We’d talk about once a month. I miss Jim. 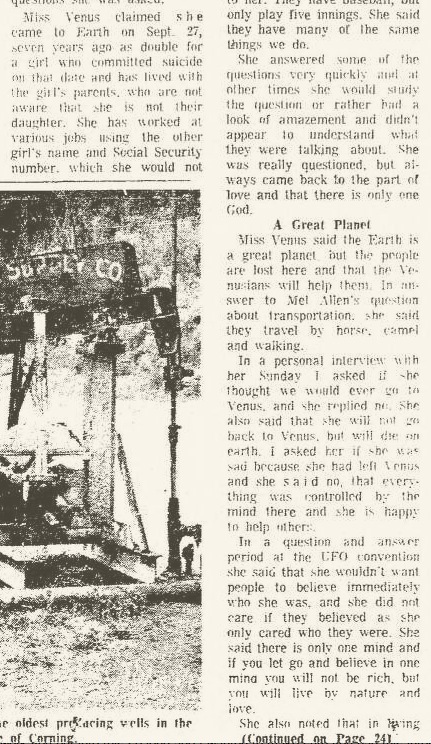 Glad to hear from you, Mel. 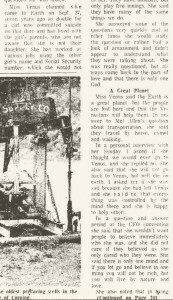 So how is the former Miss UFO?